Piggy French and DHI Topper W Seal the deal in Test Event with London rising behind - Photo by Kit Houghton. 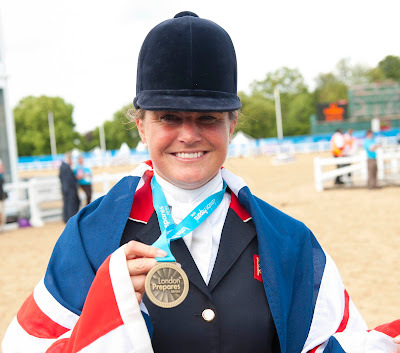 Piggy French led from the front to claim a convincing individual victory on home soil in the CIC2* Invitational eventing competition at Greenwich, the Test Event for the London 2012 equestrian events. Top ten performances from team mates Pippa Funnell and William Fox-Pitt saw GB top the leader board in the team competition too, stamping British authority all over this historic Royal parkland. Stunning performances in the dressage and cross country phases meant thirty year old Piggy from Lubenham in Leicestershire was always the one to beat going into the final phase. She dealt with the pressure and produced two immaculate clears to finish on her dressage score of 34.7, heading the leader board with the 11 year old DHI Topper W owned jointly by her father Wally French and Michael Underwood. The current World Champion, German rider Michael Jung finished second while two careful jumping rounds saw Pippa Funnell into third place. Competition is one thing but there is more than one way to measure success; the biggest medal of all should be reserved for LOCOG. Here they have staged a truly memorable event – and delivered on all fronts, setting alight the romance of the surroundings while providing modern state of the art facilities for horses, grooms and competitors alike. The result is a magnificent feat of the practical and the poetic that has inspired us all. We are in for an Olympic and Paralympic Games of historic proportion in this iconic setting with a legacy to rival all others; that of putting equestrian sport back at the heart of the Games and inspiring a new audience to take an interest in our amazing sport. In doing so, the organisers have proved beyond doubt that there could not be a better place to host the equestrian events in 2012. Next year this city will be dedicated to the Olympics and for once equestrian will be right there. Every Day Is An Eventing Day!